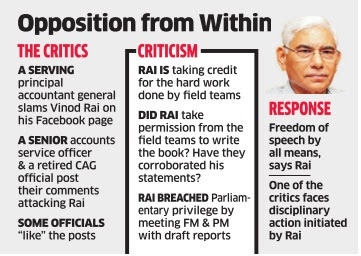 A number of officers of the Comptroller and Auditor General (CAG) have taken to social media to criticise actions of their former boss, Vinod Rai, whose book on his tenure as the top auditor has generated a political firestorm because of its claim that former PM Manmohan Singh could have prevented the telecom scam. These officials, including some at senior levels of the Indian Audit & Accounts Service, appear to be upset with a former IAS officer, who is not qualified as an auditor, running away with all the glory. Others point to what they claim are acts of impropriety disclosed by Rai in his book. These include informing Singh and the then finance minister, Pranab Mukherjee, of the broad contours of the coal report. Rai's book, `The Diary of the Nation's Conscience Keeper -Not Just An Accountant', has received widespread and generally favourable publicity, partly because its thesis feeds into a widely believed narrative that the UPA government's tenure was marked by large-scale corruption. Among the comments on this post, a higher-ranked official at the Controller General of Accounts has attacked Rai's disregard for conservatism when it comes to public disclosure about his term in office.“For an IAS officer to become CAG is just another post retirement sinecure, ho hum,“ writes the officer. Rai responded in nonchalant fashion to the attack from the auditors.“Freedom of speech by all means. I am enthused by the fact that they have spoken out,“ Rai told ET. One of his critics is facing disciplinary action that Rai had initiated, sources familiar with the matter said. Another senior auditor, who spoke on condition of anonymity, said the CAG, like any other auditor, can only verify financial statements of the government and has no business to talk to the finance minister or the PM on a draft report. 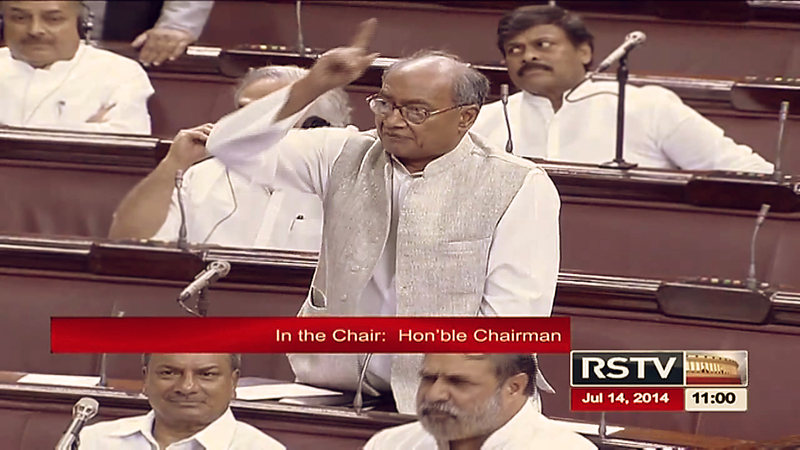 “We are answerable only to Parliament. The former CAG has committed breach of Parliamentary privilege if, as he says in a TV interview, he had gone with a draft report to the finance minister and then the prime minister,“ points out the senior official. Rai's critics make light of his claim that he came under pressure.“The President of India is the appointing authority for the CAG.Why wasn't he informed of the “pressures“?“ asks the principal accountant general cited earlier.He also wonders if Rai had sought permission to reproduce privileged communication such as papers of Cabinet Committee on Economic Affairs (CCEA) in the book.